Fresh from a sell out night at Wembly Arena, legendary UK Grime event Eskimo Dance brings the authentic sound of London to New Zealand in a touring first - showcasing an MC line up that features some of the biggest names in the scene today. Headling the world’s biggest grime party is event founder and the Godfather of Grime, Wiley who brings ‘Man’s Not Hot’ Big Shaq on a return visit to our shores after his stints at R&V and Bay Dreams earlier this year. Joining them on the EskiDance stage will be grime mainstay Lethal Bizzle, respected UK rapper P Money, East End Grime prodigy Devlin, producer extraordinaire Rude Kid and BBC Radio 1Xtra’s DJ Target. 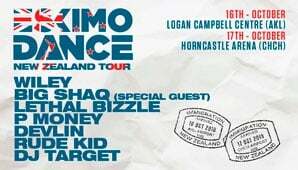 The MC fronted rave-meets-rap battle will hit Auckland’s Logan Campbell Centre on Tuesday 16th October and Christchurch’s Horncastle Arena on Wednesday 17th October as part of the Australia and New Zealand Eskimo Dance tour. Eskimo Dance was instrumental in the grime boom of the 00’s and has gone on to become the holy grail of the UK’s urban music scene. A list of past EskiDance MC’s reads like a who’s who of the hottest names in both UK underground and pop charts with heavy hitters Dizzee Rascal, Kano, Tinie Tempah, Lethal Bizzle, Skepta and Stormzy all cutting their teeth on the Eski stage. Don’t miss your chance to see some of the UK’s finest MC’s verbally duke it out battle style at the ultimate grime experience this October.